Home > Blog > Happy Birthday to Surrealist: Salvador Dali! Happy Birthday to Surrealist: Salvador Dali! "Cooking is very close to painting, when you are making a dish you add a little of this and a little of that. It's like mixing paints." As a young boy Salvador Dali dreamt of becoming a chef, instead he produced over 1500 paintings in his artistic career, utilising all and any available materials at his disposal. More often than not he practiced with oil paints and linseed oil on canvas, however still employed techniques of the old masters and frequently mixed his own paint using the Tempera method. A combination of egg yolk with vinegar or water and of course the pigment of choice creates a permanent and fast-drying painting medium. Give it a go yourself with the range of pigments on sale at the Cass Art Islington Flagship store. At the age of 13 years old, Dali's father hosted an exhibition of his son's charcoal drawings in his home town of Figueres, Spain. What is often considered a basic technique for creating art, proved to be the most important. Dali continued to sketch and illustrate throughout his career - his mixed media illustrations for Lewis Carroll's Alice in Wonderland are particularly compelling and explore a range of materials - chalk, pastel and splattering's of ink. Salvador Dali's might not be championed for his watercolours, but he should be! 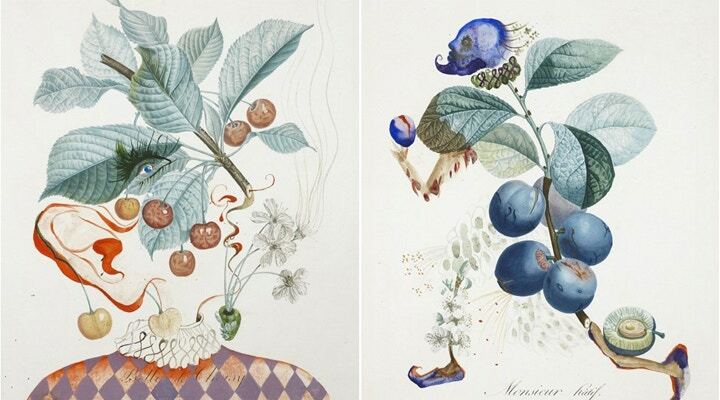 This botanical series explores illusionism and metamorphosis, seeing two images within one. The exquisite detailing was achieved with a fine sable brush, watercolour and gouache. Contrasting to his often broad brush strokes in oils, Dali shows his patient side with precise time-consuming watercolour illustrations. "You have to systematically create confusion - it sets creativity free." Along with sculpture, paint explosions, costume design and theatrical productions Dali truly immersed himself in every kind of creative project. In 2003, a newly released and remastered animation, entitled Destino, by Salvador Dali and Walt Disney was showcased for the first time. This stunning collaborative piece proves to fans and followers of Dali that his influence and allure continues to charm even in a digital age, near 20 years after his death. Cass Art stocks a vast array of art supplies for you to begin your own journey with Surrealism! Begin with some sticks of charcoal and an A3 cartridge pad before moving onto your own set of oils. Shop online now and remember to follow Cass Art on Facebook and Twitter for all the latest on art news, materials and exclusive customer deals.